Birch Evans "Evan" Bayh III is an American lawyer and Democratic politician who served as the junior U.S. Senator from Indiana from 1999 to 2011. He earlier served as the 46th Governor of Indiana from 1989 to 1997. Birch Evans "Evan" Bayh III (/ˈbaɪ/ BY; born December 26, 1955) is an American lawyer and Democratic politician who served as the junior U.S. Senator from Indiana from 1999 to 2011. He earlier served as the 46th Governor of Indiana from 1989 to 1997. 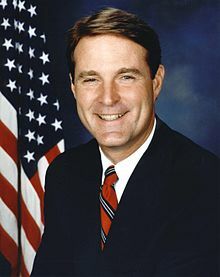 Bayh first held public office as the Secretary of State of Indiana, elected in 1986. He held the position for only two years before being elected Governor. He left his office after completing two terms and briefly took a job lecturing at Indiana University Bloomington, before being elected to the U.S. Senate seat once held by his father, Birch Bayh. On February 15, 2010, Bayh unexpectedly announced he would not seek reelection to the Senate in 2010. After leaving the Senate, he was replaced by his predecessor, Dan Coats, and became a partner with the law and lobbying firm McGuireWoods in the firm's Washington, D.C., office, and also became a senior adviser with Apollo Global Management. He was a part-time contributor for Fox News from March 2011 to July 2016. In June 2011 he became a messaging adviser for the U.S. Chamber of Commerce. On October 27, 2011, it was announced that Berry Plastics Corp. had appointed Bayh to its board of directors. Bayh also serves on the board of directors of Marathon Petroleum, the 2011 spin-off from Marathon Oil. Following the withdrawal of 2016 Democratic primary winner Baron Hill, Bayh announced that he would be running to take back his old Senate seat from retiring Republican incumbent Dan Coats. He was defeated by Todd Young in the general election.